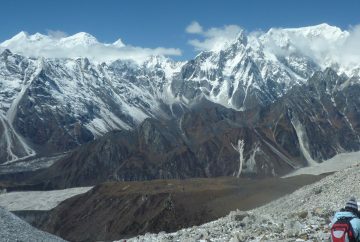 Manaslu Circuit Trek is a treasured trekking route that offers pristine mountain views, unique culture and thrilling adventure. Since the area only opened to trekkers in 1991, the region has successfully preserved its distinctiveness and offers a great combination of exclusive culture, unmatched natural beauty and rich bio-diversity. The eighth tallest mountain in the world, Manaslu (8163), stands tall in the very center of the Nepalese Himalayas. The trek starts from Aarughat, a small village in Gorkha district, and follows the ancient salt-trading route with Tibet along the Budhi Gandaki River. The trek takes you to the off beaten tracks passing through colorful villages filled with prayer flags, Mani walls, splendor of pine, bamboo and rhododendron forests and monasteries along the dramatic landscape of the Manaslu Circuit. The trek gives a wonderful opportunity to get an insight into the local culture and lifestyle. The people of the Upper Budi Gandaki region are known as Nupri (the Western Mountains) who are direct descendants of Tibetan Immigrants and still retain the strong Tibetan culture. The trek may be an excellent opportunity to explore this exclusive local beliefs and lifestyle. Manaslu’s unmatched natural magnificence and rich blend of Tibetan and Nepalese culture makes it a perfect trek for anyone searching for wilderness and ‘authentic’ village experiences. Manaslu Circuit trek is a famous alternative for Classic Annapurna Circuit Trek. Parts of the Manaslu Circuit Trek take you over 2900 meters where It is common for trekkers to have adverse effects of altitude regardless of the fitness, age or gender. Acute Mountain Sickness (AMS) is experienced while climbing the high altitude quickly without letting the body acclimatize. AMS is caused due to reduced air pressure and reduced oxygen level at high elevation. The best way to avoid AMS is to let the body adapt to the thin air of mountains by acclimatizing. Your safety and experience is our paramount concern. Our itinerary is specially planned to let you acclimatize properly. All our guides are experts in detecting any symptoms of altitude sickness and are well skilled with first aid medication. Experience the majestic beauty of the Manaslu Massif in this exceptionally beautiful mountain trek with Himalayan Eco Treks and Travel- Nepal. We are experts in adventure holidays in Nepal and work very hard to make your holiday full of pleasant experiences. We will take care of every detail of the trek including any special permits and formalities required for the trek. So, you are left to simply relish the great adventure of this wonderful trek. As an advocate of responsible and sustainable tourism, Himalayan Eco Treks and Travel – Nepal is proud to support Shree Gauri Shankar Primary School, at Samagaon in this trek for the welfare of the school children of this region.